Brian writes: As a kid growing up in Toronto, playing with LEGO was my favorite thing to do. Back then, LEGO sets were not as specialized as they are now – these days it’s hard to buy a set that isn’t associated with Harry Potter, Star Wars, or some other overarching theme (though now that I’ve said that, I have just heard that they’re going to be releasing Lord of the Rings LEGO sets, and that excites me a great deal!). Granted, there did exist themed sets back then as well… police stations, fire stations, spaceships, construction vehicles and much more… but there were also large basic sets with less specialized pieces that you could use to construct any sort of model you could imagine. And there were also LEGO idea books filled with examples of different things you might try to build – as a kid I thumbed through my own LEGO idea book so often that by the time I became a teenager its pages were faded and torn. I kept my copy of that book; my kids love it, too. The glory days of creating LEGO models from your imagination are, for the most part, long gone. And the truth of the matter is, over the past few years, LEGO isn’t the only thing that has moved in this direction. More and more often, kits, sets and crafts are sold in such a way as to dictate how they should be created. Color by numbers, stitch by pattern, snap together by instructions… fewer crafts are being sold in a way that sparks the imagination of children. The drawback of “Creativity by Instruction” is that children are given the idea that there is a “right” way to create. If you’re painting by numbers and you color the sky purple instead of blue, you’re “wrong”. 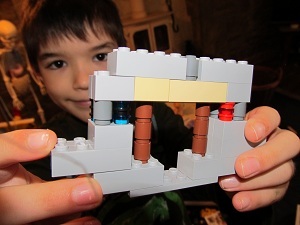 If you’re building a LEGO set and you put a door where the window should be, you’re “wrong”. Not coloring between the lines? “Wrong!” This is even more prevalent in a classroom setting where all too often the creativity of students is hampered by the idea that students’ output should somehow be gradable. Students are graded not on how creative the output they produce is, but at how closely said output follows “the rules”. Because of this, grading turns out to be a lot more like technical gymnastics and a lot less like ice dancing. In my opinion, creativity should be more like ice dancing… but with no judges! Our children and students deserve to feel that, for them, the sky is the limit – whether it’s purple or blue. True, learning to follow the rules is important – most parents don’t aspire for their kids to grow up to be anarchists. But it’s also important to learn to break the rules, or at least to bend them a little. 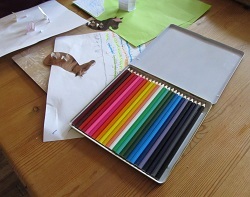 Give your kids a blank piece of paper and some crayons and tell them to go wild. Take them out into nature and gather up a bunch of leaves, twigs and pine cones – put the stuff you’ve found in a big pile in front of your kids and see what they do with them. As an example, here’s something my daughter (now six years old) created. It’s a pony. 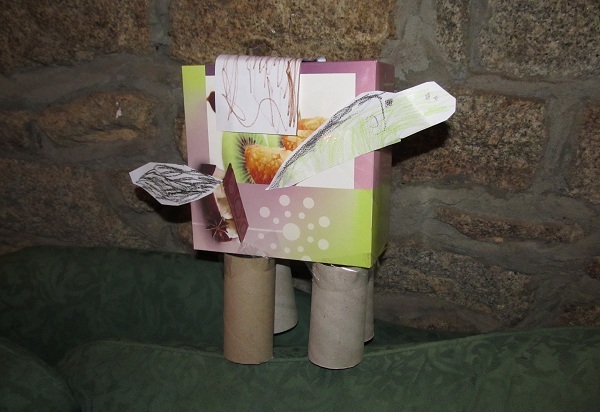 I didn’t give her any of the “ingredients” to create this pony… all by herself she found three empty toilet paper rolls, a paper towel roll, some paper, some crayons, some scissors, some tape and a pastry box from the local bakery (living in France we do tend to have a few of those lying around). She whipped up her pony and asked me what I thought? I thought it was excellent – even though it looks much less like a pony than the sort of pony you might find in a Do-It-Yourself kit. Set your kids free from boundaries, and see what their imaginations can come up with! Thanks Amy – I appreciate it! Sure, you could feature this post on your blog. My son is still very into LEGO and LEGO Mindstorms – just last month we went to LEGOLAND in Florida, and he really loved it… lots of great rides to ride and exhibits to see.